Wasting Disease. In 1931, an epidemic hit the eelgrass populations in the Northern Atlantic Ocean, in both North America and Europe, that resulted in an approximate 90 percent loss in eelgrass. The “disease” progressed and spread to eventually infect the eelgrass populations in the Pacific Ocean as well, but its impact on eelgrass populations in this region was significantly less than what was recorded for the Atlantic populations. 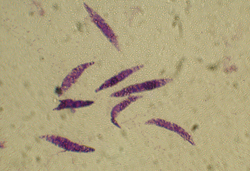 The cause of the disease was not clear for some time after the outbreak, but was later discovered to be caused by the cellular slime mold, Labyrinthula zosterae. Eelgrass populations did recover, but in many cases, they never attained their pre-Wasting Disease levels. Wasting Disease is still present in modern day eelgrass populations. Those populations that had survived the epidemic in 1931 were found to be resistant, but not immune, to Wasting Disease and are therefore still susceptible to infection when stressed. Algae Blooms. Poor water quality in our coastal waters contribute to the explosive growth, or blooms, of algae (microscopic plankton and macroalgae), known as eutrophication. While algae blooms are a normal, cyclic event in most estuaries, occurring in spring and fall, some blooms, especially those fueled by coastal nutrient input, can persist for long periods and can significantly reduce light and oxygen in the water column, stressing eelgrass and other organisms. Phytoplankton blooms are by far the most common form of bloom, but high nitrogen levels in an estuary may cause fast growing species of macroalgae (i.e., seaweeds) to put on prolific growth, forming mats that compete with eelgrass or can potentially smother an eelgrass bed. On Long Island, the most infamous algae bloom has been the Brown Tide. Brown Tide. 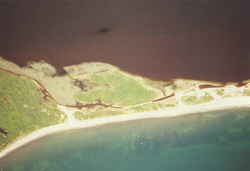 In the mid-1980s, the Long Island's eastern and southern bays suffered from blooms of Aureococcus anophagefferens, known as brown tide, which turned our waters a coffee color. The Brown Tide not only caused large-scale die offs of eelgrass due decreased light availability, but bay scallops populations also plunged. 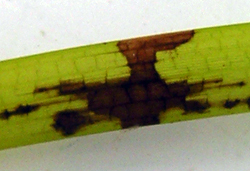 It was in the second year of the bloom that eelgrass loss became obvious. 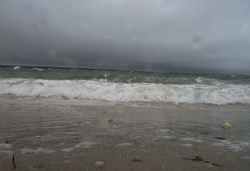 Eventually, the bloom subsided, but another bloom occurred in the mid-1990s further stressing recovering eelgrass populations in the Peconic Estuary. Brown Tide occured in the South Shore Bays, but the bloom’s effects on the eelgrass populations in these areas was less severe. Although the direct cause(s) of the Brown Tide are still not clear, poor water quality and elevated water temperatures have been suggested as a likely catalysts. Macroalgal Blooms. Although it is more of a localized event in our estuaries, macroalgae (seaweed) blooms can negatively impact eelgrass populations. Macroalgae blooms usually occur in response to increase nitrogen in the water column and will grow in, on and on top of eelgrass meadows, competing for light and nutrients. Eelgrass populations can cope with short periods of macroalgae blooms, but chronic, high biomass blooms may eventually contribute to the decline in eelgrass populations. 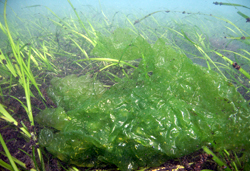 Common macroalgae species like Spyridia filamentosa and Ulva lactuca (sea lettuce) are omnipresent in eelgrass communities and also pose the greatest threat if water quality deteriorates. Thankfully, damaging, macroalgal blooms are uncommon in our coastal waters, but their threat to eelgrass populations still exists. Bioturbation. Eelgrass meadows support a wide variety of animals within their boundaries and to which an array of services are provided. The eelgrass meadow acts as a home, food supply and nursery and in fulfilling these roles, the eelgrass population takes some wear and tear. Normal use by animals that results in disturbance, referred to as bioturbation, can typically be regenerated by an eelgrass population through vegetative growth or seed production, however, when the balance is shifted, with either an increase in bioturbation or decrease in regenerative potential, eelgrass populations start to decline. Sources of significant bioturbation in eelgrass populations in Long Island include crabs (specifically spider, green and mud crabs), whelks, and water fowl. Crab and whelk damage results from the animals uprooting eelgrass plants during their foraging for food. 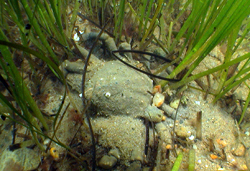 Crab populations, especially spider crab, have observably increased in recent years, resulting in more crab damage to eelgrass meadows than before. Large numbers of whelks have been observed “plowing” through eelgrass meadows, leaving behind loosely anchored or completely uprooted plants that are easily washed away by currents and waves. Grazing by waterfowl, especially Canada geese and mute swans, of both the vegetative and flower shoots may also have an affect on eelgrass populations. In the past, eelgrass likely experienced grazing pressure by waterfowl seasonally, allowing for long periods of recovery between the spring and fall migrations. Today, with the “resident” populations of geese and swans, eelgrass meadows may face constant grazing pressure resulting in population decline. Climatological Change. Global climate change has had and will continue to impact eelgrass meadows. With increased average temperatures comes the rise in sea level and the potential for more powerful and frequent storm events. The increase in sea level will limit the depth at which eelgrass can grow and will result in a gradual migration of eelgrass populations shoreward. Couple this shoreward movement of eelgrass beds with the increasing percentage of hardened shoreline in our estuaries, and, eventually, eelgrass will have a very narrow range in which it may grow. With eelgrass populations restricted to narrow areas along the shore in relatively shallow water, the erosional impact by major storms on eelgrass meadows becomes much greater. Global temperature rise relates to sea temperature as well as air temperature. Eelgrass is a temperate seagrass and prefers cooler waters. Near its southern limit for growth in the Chesapeake and the Carolinas, eelgrass sheds its leaves in the summer months and relies on food stored in its rhizomes due to high summer water temperatures. While these southern populations have adapted to these conditions, the Long Island eelgrass populations have not and meadows in some shallow creeks and bays may be stressed to the point of die-off. For more on climate change impacts on seagrasses, view our summer 2006 issue of SEAGRASS.LI. Boating Activities. 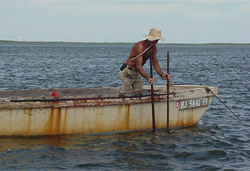 Boating is a popular pastime in LI waters and generally, boating and eelgrass do not come in conflict as eelgrass inhabits shallow areas where most boats don’t travel. However, evidence of boating damage to eelgrass meadows is observed in our estuaries. 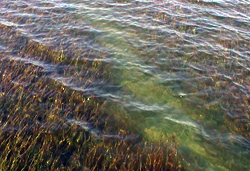 The damage is typically caused by boats navigating in shallow eelgrass meadows without properly trimming the motor to reduce its impact on the bottom. This kind of damage is called prop-scarring and is identified by long, shallow trench cut into a meadow. Prop-scarring not only uproots the eelgrass in its path, but due to the trench that is formed, erosion of along the exposes meadow edges may cause additional plants to be lost over time. Associated with boating is anchoring and mooring. Setting any kind of anchor in an eelgrass meadow will result in disturbance to the adjacent plants. Temporary anchoring can result in “tilling” in a meadow until the anchor sets. Then, when the anchor is removed, a large turf of grass is usually uprooted with the anchor. Boat moorings placed in eelgrass meadows will also cause disturbance. 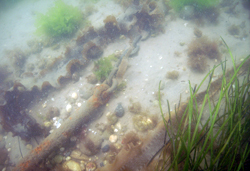 Not only is the anchor sitting in the eelgrass, but the chain that connects the anchor to the mooring buoy drags through the eelgrass, resulting in an unvegetated area around the anchor. Dredging. The dredging of channels in creeks and small embayments for navigation was human induced disturbances faced by eelgrass. Many of the creeks in the Peconic estuary lost their eelgrass meadows to channel dredging. The eelgrass typically grew in the deeper parts of the creeks which required less dredging to achieve a deep channel, but almost entirely eliminated the eelgrass meadows. Dredge spoils also attributed to the decline of eelgrass meadows when the spoils were washed from the “re-nourished” beaches where they caused the eelgrass to be shaded by the increased turbidity or buried under the transported sediment. Hardened Shorelines. With the increasing population and development on Long Island, a large percentage of our shorelines are slowly becoming bulk headed or hardened. Hardened shorelines change the physical environment of near-shore waters by reflecting wave energy and changing erosion/accretion dynamics. 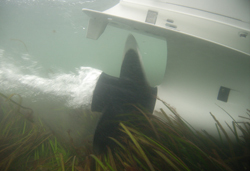 Wave energy reflection can be a significant detriment to shallow eelgrass populations. Waves that normally played out their energy along the gentle slope of the beach, now hit perpendicular surfaces that cause much of the energy to be reflected back off-shore resulting in erosion and increased turbidity in the shallow eelgrass meadow. 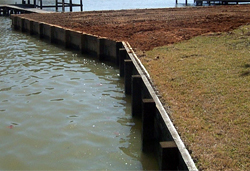 Docks reduce the amount of light that reaches eelgrass, and propellor wash can stir up the bottom, decreasing light and increasing erosion to the eelgrass bed. Shellfishing. Shellfishing is a Long Island tradition. Be it digging clams or dredging for scallops, shellfishing activities are widespread and common in our estuaries. 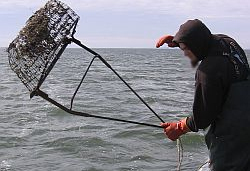 Typically, shellfishing in eelgrass meadows has been limited to scallop harvesting. 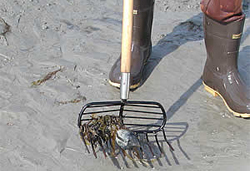 However, recreational clammers and a few commercial baymen have been observed digging clams in eelgrass meadows. In most cases, the damage done by casual clamming is minor and, given time, the meadow will repair itself. But, chronic clamming in areas will eventually overwhelm the population’s ability to regenerate the meadow and the population decline or disappear totally. 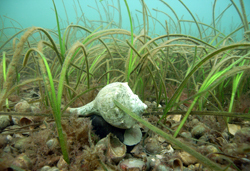 Scallop harvesting, while employing equipment called ‘dredges’, has little or no impact on eelgrass meadows, if used properly. 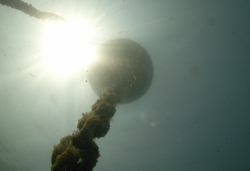 Weighted or improperly rigged dredges can cause the dredge to dig into the bottom and resulting in damage to the eelgrass. **Photo credit: Labyrinthula was isolated from eelgrass collected from Fisher's Island using the methods of Muehlstein et al. (Muehlstein LK, Porter D, Short FT. 1988. Labyrinthula sp., a marine slime mold producing the symptoms of wasting disease in eelgrass, Zostera marina. Mar Biol 99:465-472.). It was isolated by students Jaci Benson and Laurie Hofmann of St. Mary’s College of Maryland, students of Chris Tanner, professor of biology.